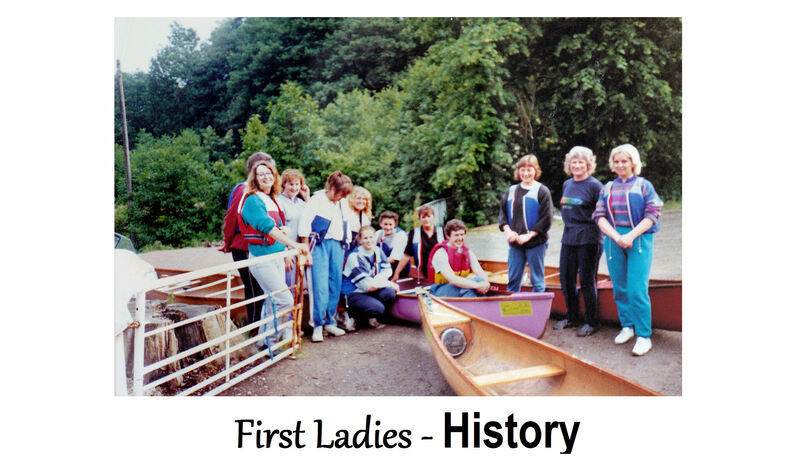 The inspiration for founding Dyffryn Conwy Paddlers in 1991 came from a group of paddlers who had started canoeing on the 'Women Only' canoe courses run by Jackie Freer and funded by The Sports Council for Wales. 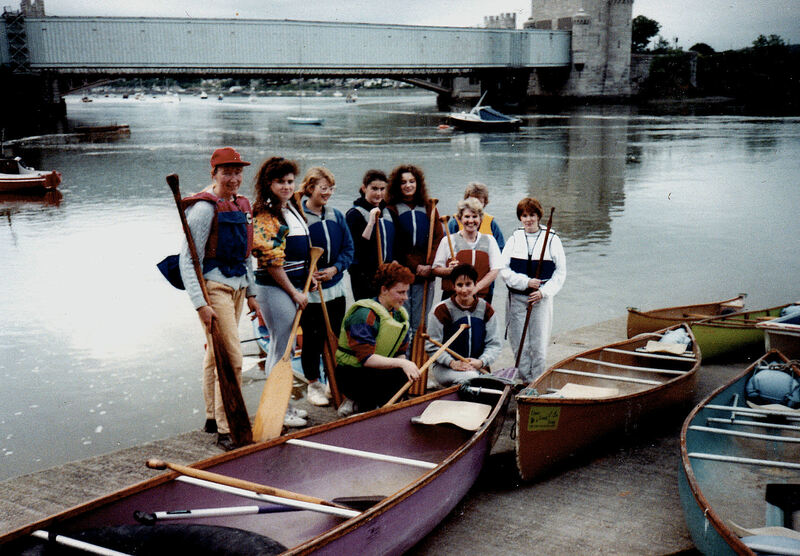 The enthusiastic women then wanted to continue with canoeing so they and Jackie decided to start a family orientated touring club, however very quickly the marathon interest, led by Kevin Coleman, became an important aspect of the club's activities. Grants from the BCU Marathon Committee and Conwy Sports Council allowed the club to buy a variety of second hand boats to expand the range. For the first two years the club was homeless and the boats lived on two trailers. Despite this there was a high level of enthusiasm and members took part in a wide range of events. Within a year, weekly time trials started and in 1992 a ladies K2 successfully completed the Devizes to Westminster Canoe Race (or DW as its often called). 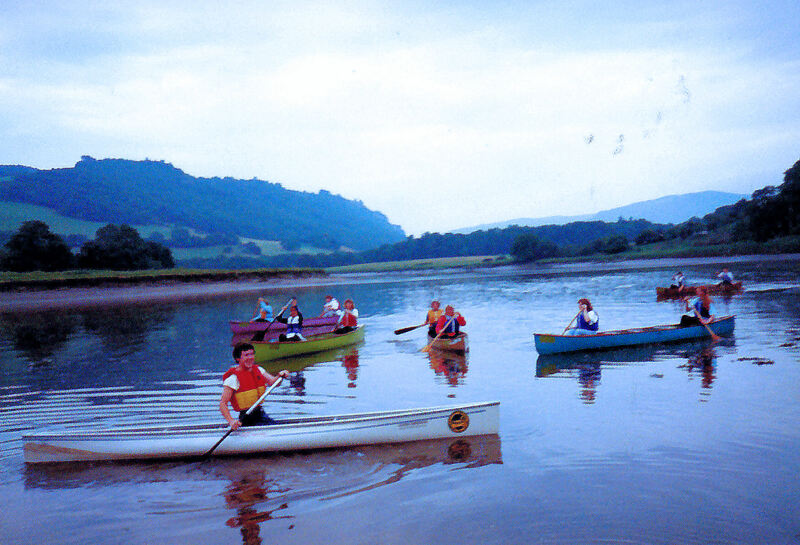 In 1993 the local scout club offered a share of their Conwy site including space to construct a boat compound. With these improving facilities the membership continued to grow and there was considerable demand for the boats that were available. A large grant from The Foundation for Sport and the Arts in 1995 allowed the club to buy a comprehensive range of boats. Again, membership continued to increase, peaking at over 80 in 1996. The DCP (Dyffryn Conwy Paddlers) became a well established club and the home of the club continued to be with the Scouts until 2012 when a suspected arson attack destroyed all of the club boats and compound and very seriously damaged the scout hut. Our favourite launching point is sited just upstream of Conwy harbour and about two miles from the open sea and with another 14 miles of tidal river water on the upstream side. A tidal range of over 10m produces fast tides and strong currents but the estuary can also be beautifully calm. Stable kayaks play a vital role in allowing new paddlers to experience the estuary and the club can provide boats for just about any standard of paddler. No two paddling sessions are ever the same and the variety caused by the water levels, tide and weather changes adds to the appeal. The area is famous for wild birds and the upper stretches of the estuary are popular with trout and salmon fishermen. Membership has always been fairly evenly split between recreational and racing paddlers; most of the racers also take part in recreational events and many of the recreational paddlers end up doing a race of some sort sooner or later. In the early days the club was about 75% female but in recent years things have levelled off at around 50/50. The relatively high female presence compared to other clubs is probably due to the original Jackie's women only groups. Since then, there has always been a fairly even mix of female paddlers and the ladies don't feel unusual or out of place in whatever aspect of paddling they try. The outstanding recreational paddling available may also help, which appeals to people who only have time to paddle occasionally. In recent years the committee has been largely female but the club does not debate whether this is because of the organising talent of our women or less methodical men. The competitive activities of the club are predominantly marathon orientated. Racers compete in the NW England Hasler region, as there is no other marathon club in North Wales. Members also frequently race at Ironbridge, Worcester and Nottingham in K1, K2 and K4 boats. Many of these racers do it for enjoyment and fun, even when they have no chance of winning. For instance two K2 crews of Div 7 and 8 paddlers entered the Div5/6 race at Ironbridge so that they could race the longer course over the rapids. Similarly a crew of stable boat paddlers, with just one K1 experienced paddler, formed a K4 crew at Worcester. They were last home but still dry and thrilled to have completed the race. Incidentally the K2 and K4 crews were all female. In 1998, 1999 and 2000 DCP members were included into the Welsh team, and for these three years travelled to Scotland for a week of marathon racing at a time. This team also entered Irelands Liffey race in 1998, which was sponsored and filmed by S4C (the Welsh channel 4). DCP members have entered the Liffey most years since 1992, with results ranging from bronze medals in Junior K1 and Veteran K1 to several damaged boats. The new club joined the management group of the older Conwy Ascent race, but gradually the other clubs fell away and the event has been very successfully organised exclusively by DCP for many years. This is always an unpredictable event where the weather has a very strong influence on conditions. Some years the only waves are formed by numerous speedboats, other years it’s a battle against wind and waves from start to finish. There are usually well over one hundred entries, ranging from rafts of GP boats that complete the tour slowly, to some of the country's top marathon paddlers battling for the finish. DCP club members enjoy the Conwy Ascent Challenge, and participating with other paddlers in 'their' river. 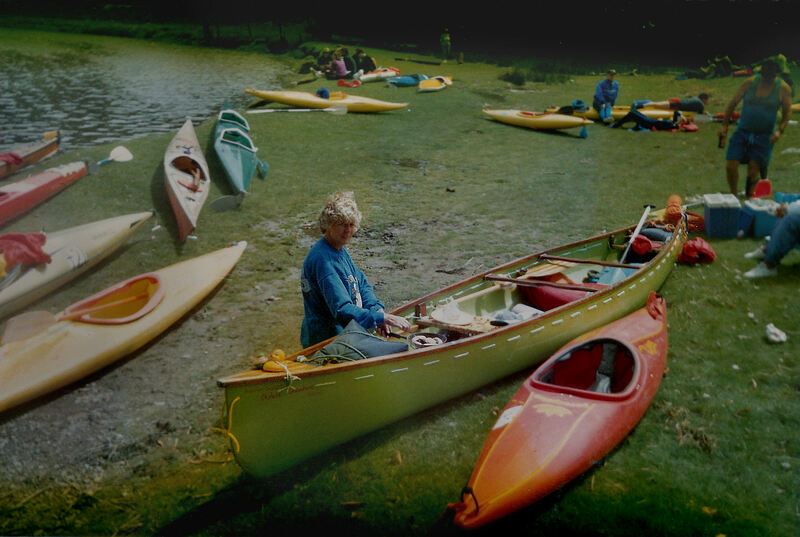 For several years the nearby Plas y Brenin outdoor centre ran a mountain triathlon, which included a canoeing section. This brought several people into the club as runners and cyclists who wanted to improve their paddling fitness or learn to paddle racing boats. Unfortunately the event is no longer run and several members have been lost as a result. However, in recent years, the DCP assist the ‘Fabian 4’ Mountain Challenge, which is triathlon event including a section on the Conwy river in kayaks or canoes. A few club members have also competed in sprint regattas in K1, K2 and C1 and the club's most successful paddler, Matthew Foulger, was a member in the GB sprint team. As the nearest regatta course is in Nottingham, visits are not very frequent and the club misses local sprint regattas, which used to be held in Chester. DCP often entered more than one team of four paddlers as a good way to introduce people of all standards to sprint racing. The club was involved in wild water racing and for a while, organised one of the races on the Tryweryn each year. In the past members have been successful in the Welsh Wild Water Championship and in various other races. James Wingfield became a C1 and C2 coach for the GB team. With the sea on the doorstep several people have done sea kayaking in some form – even night trips around the Orme can be spectacular during the right conditions and Puffin Island is only a short crossing away. The Conwy Ascent race is a registered event by Canoe Wales . This race and tour is organised by Dyffryn Conwy Paddlers and is still a very successful and popular event. At one time, it was a 'double header' with a sea kayak race the following day, although the sea kayak race no longer exists. DCP was also represented in the Sea Kayaking World Cup in Papua New Guinea in 1998 where Wales won bronze. As well as the weekly time-trial and recreational sessions the club visits local lakes, rivers and beaches and organises social events both on and off the river. It has also arranged coaching sessions for marathon paddling, entered dragon boat races and been represented in the Coast to Coast triathlon across New Zealand, a triathlon across Tasmania and a four day open C2 race in Canada. The accommodation is not plush, the water can be a long walk away at low tide, or flood the hut at very high tides, but the club does not lack enthusiasm or variety. In its early years, DCP achieved a lot. Even to this day DCP are working with the WELSH CANOING ASSOCIATION (WCA) to try and establish Conwy as a centre of excellence for canoeing. 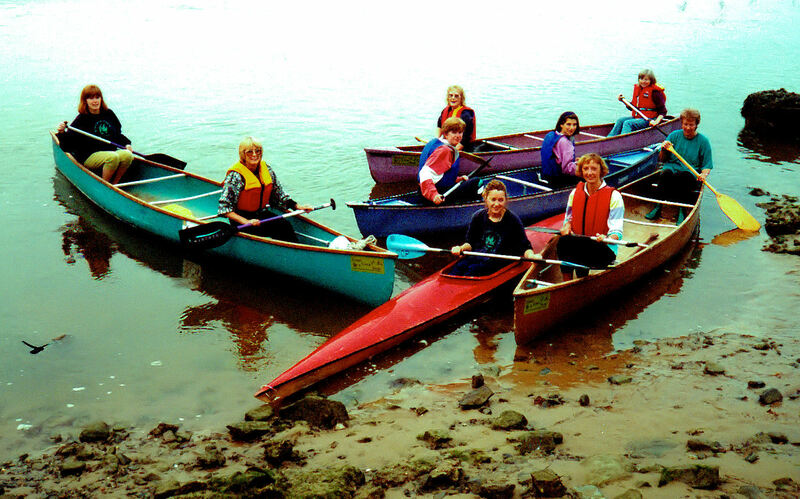 1991 The Club is founded in October following the women's courses Jackie ran over the summer.The steering committee includes Sue Vincent, Jude, Jackie, James and Kevin.Fitness training happens in Conwy Civic Centre on Tuesdays with various river tours on Saturdays. Boats are mainly C2s (Open 'Canadian ' type Canoe) from Kevin's touring business. Grants are received from Aberconwy Sports Council and the BCU. A lot of training sessions are organised for white water, slalom and marathon. 1992 Evening paddling and time-trials start. The first time-trial includes Pat, Jackie, Ben and James. Katie and Fiona complete the DW. Their support team includes Pete Bray, who has just canoed across the Atlantic. Ben and Matthew are both Welsh National Champions for white water racing in their respective age groups. Three club K2s enter the Liffey race; two of them fold on the first weir (Jackie & Kevin and Tom, and Katie) but James and Jenny make it to the end. 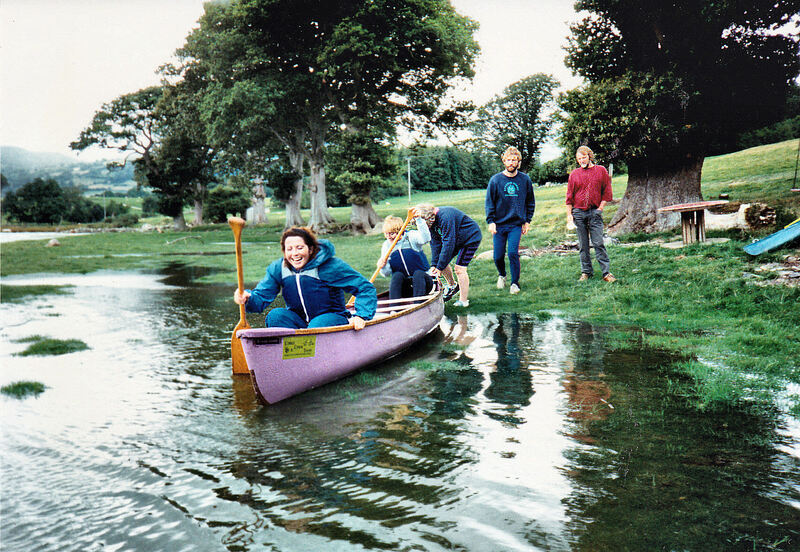 1993 The Scout Hut is in use and the boat racks are being developed. A team takes part in a Dragon Boat race on Albert Dock. Again three K2s enter the Liffey but this time all three finish. Matthew is racing in division 6 while Ant and Ian are division 7 and Jude is division 9. 1994 Sue Kenwell and Pete both join. Ant, Jude, Jackie and Kevin go the Puffin Island in K2s. Several people take part in Colwyn's canoe triathlon and others do the Plas y Brennin triathlon. Tom & Sandra, Ian, Matthew and James all complete the Liffey but it is the first of Ant's unsuccessful trips as he and Kevin fold the boat on weir 2. Matthew is now division 5, Ant and Ian are in 6, Jude is 8 and Sue Vincent 9. The club has 62 members. 1995 The slipway at The Ferry is lost when the pub is demolished. The club gets a grant of £10000 from the Foundation for Sport and the Arts to buy equipment. Several people compete in white water on the Teifi and dozens attend the Geirionydd barbecue. 1996 Ian attempts the DW but has to stop at Staines when his partner's back gives out. Matthew wins junior bronze at the Liffey but Jude and Matt don't get past the first weir. James and Ant beat Ant's previous record but have to pull out at the lake. Jackie hands over the newsletter job to Margaret. 1997 Steve joins. Matthew is now racing in division 3 and is at university in Nottingham. Pat and Denise start doing the time-trials as a K2. Kevin and Fiona are stopped by the police for carrying a K2 on a short car without lights on the boat. Big waves for most of the course make an interesting Conwy Ascent. Pat, Denise, Kamala and Penny enter the K4 race at Worcester. They are slow but stay upright. 1998 The first Scottish marathon week is held. Wales sends a team, which includes James, Matthew and Pete. Steve, Kamala, Jude and Penny take part too. The Welsh team also enters the Liffey where Pete paddles the second half backwards due to a damaged bow and Steve sinks in the jungle. James takes part in a sea kayak championship in Papua New Guinea. Pete is division 5, Steve is promoted to 5, Kamala is 8 and Penny is promoted to 7. Kamala takes over as newsletter editor. 1999 Matthew is selected for the British sprint racing team for the first time. He is also elected Sports Personality of the Year in the Weekly News. A smaller Welsh team, which now includes Steve, attends the Scottish series. Jude & Denise and Kamala & Penny brave Jackfield Rapid and do the Ironbridge long course. James and Steve enter the Liffey as a K2 but lose their rudder so don't finish. Matthew is now in division 2. Kamala is promoted to 7. James is demoted to 4. 2000 Jude leaves us for New Zealand where Matthew joins her for the winter. David and Sarah start paddling with us. Steve and James do the Scottish series again. James runs a marathon training weekend at Pencelli. The website is born. The Conwy Ascent benefits from a big tide and several records are broken although there are also a record number of swimmers in the harbour and a K2 is written off. Matthew races K1 in the National Championship at Boulogne for the U23 team and K4 at the World Cup in Germany for the senior team. Pete is promoted to division 4. 2001 Foot and Mouth affects racing and limits the Conwy Ascent to a race to Tal y Cafn and back. A sea kayak race is held on the Sunday after the Conwy Ascent. James takes part in the Masters Marathon Worlds at Stockton. Matthew takes part in the Sprint Worlds in the senior K4.Steve is promoted to division 4. A team of around ten club members are elected to various tasks to manage club aims and objectives. The committee meet approximately every six weeks to discuss and plan future activities, resolve existing issues as well as day to day club administration such as membership records, paddling competencies, finance, communication with members, updating this website, update and maintain administrative records, report on boats and equipment etc. Individual committee members have responsibility for different aspects of club activity, and our Chairperson, Penny has overall responsibility for the smooth running and development of the club. DCP focus on both paddlesport disciplines - COMPETITIVE PADDLING and LEISURE PADDLING. Most of our members enjoy both to varying degree, with marathon racing and touring being the main activities. We paddle flat water rivers, lakes and canals with a bit of sea kayaking if it's calm enough. Club members pay a relatively small annual subscription which includes affiliation to the Welsh Canoeing Association. If you are already a member of Canoe Wales, our subscription is at a discounted rate. Members pay a reasonable hire fee to use club boats. This cost is essential revenue to fund and maintain our club and our equipment. Boat fees are generally paid at the start of a paddling session. A senior member of the club will take charge of payment. Advance billing can also be arranged for those who prefer to pay for a year’s use in advance. Our boats and kit are not for hire or loan to anyone outside of the DCP club. Our existing kayaks are relatively new and were bought from kayak manufacturers ‘KIRTON’ and ‘MARSPORT’. The kayaks are stored securely and Senior members only have keys. For routine paddles, a keyholder will be on site to release the boats and equipment. The initial meeting point is the large car park to the South of Conwy Castle. Senior club members are responsible for logging the boats in and out. This arrangement is necessary for safely logging paddlers returning to base as well as recording the use and popularity of each boat. The procedure also tracks boat fees. Please treat our boats with care so that they remain undamaged and keep looking their best. Although the municipal car park suits our needs for most of the time, we realise it is not a perfect location. It can be difficult to handle the long kayaks when the car park is busy. The boat collection and return area isn't ideal for changing in and out of paddling gear either so it's a good idea if you are a wetsuit paddler to arrive in your gear. We are looking for a suitable permanent home since an arson attack destroyed our compound and all boats in 2012. Suitable land near the river, planning permission and cost are the main obstacles to gaining a permanent site but the DCP club are looking into it.